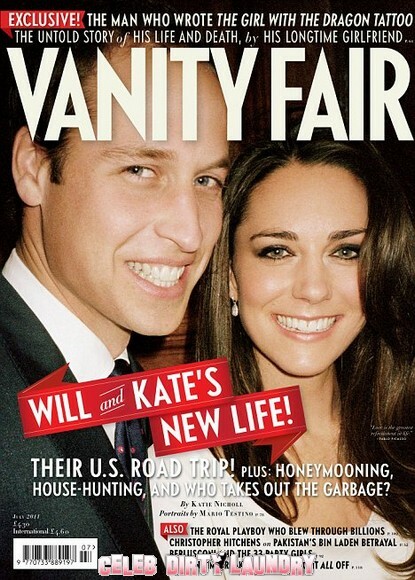 Prince William and Kate Middleton, the new Duke and Duchess of Cambridge grace the July 2011 issue of Vanity Fair. The photo of the beaming couple was taken by photographer Mario Testino, 56. The issue includes never before seen photos of the couple. It also includes Mario’s 1987 photo of William’s mother Princess Diana. Mario went on to say they are a young couple in love and despite the pressure of the photoshoot Kate looked fabulous and her and William glowed with happiness. Mario was also the photographer who took William and Kate’s engagement pictures at St James’ Palace last November. The issue of the Vanity Fair hits stands June 3rd, 2011.